Buying carpet is not something most people do often; in fact, some may only shop for carpet a few times in a lifetime. Because of this, it is easy for consumers to be confused by the carpet buying process, and end up with a carpet that will not suit their needs. This is probably the number one thing we caution people against when shopping for carpet. Do not assume that a carpet with a higher face weight is better than a carpet with a lower one. It is an easy mistake to make because we can easily grasp the concept of assigning a numerical value to something to indicate quality – in other words, we “get” the idea that a bigger number (weight) is better. When it comes to carpet, however, there are too many other factors that come into play when determining the overall quality. Unfortunately, many salespeople are either too uninformed or too indifferent to explain this properly to customers. It is easier to tell someone that 50 oz. carpet is better than a 40 oz. carpet than it is to explain all of the other considerations: twist, density, etc. This is just about the worst mistake you could make when buying new carpet. Believe us, we know how hard it is to justify spending extra money on something you can’t even see. You would likely prefer to save the money and spend it on things you can sit back and look at – take the money you save on the underpad and buy a new lamp, perhaps. But most of the time, it’s what you can’t see that matters the most. For example, consider the tires on your car, or your mattress. Neither have any aesthetic value, but both are extremely important for your safety and your comfort. The same goes for carpet underpad. Underpad saves wear and tear on your carpet by absorbing the impact of foot traffic so the carpet doesn’t have to. Not only will a better grade underpad feel more comfortable to walk on; it will also help your carpet look better for a longer period of time than a low-quality pad would. We cannot stress it enough: your carpet is only as good as your underpad. If you are working on a tight budget, We highly recommend spending a bit less on the carpet and a bit more on the underpad. A lower-quality carpet will look, feel and perform better with a high-grade underpad. This warning especially holds true if you are getting quotes from different retailers on different products. As the saying goes, be sure you are comparing apples to apples! Just because two carpets look and feel the same, it does not necessarily mean they will perform the same. So how can you compare different products? Be sure that they are made of the same fiber, they are the same style and are of the same quality. Also, closely compare the manufacturers’ warranties on the carpets. If one carpet has a 10-year warranty and the other has a 20-year warranty, you are obviously not looking at the same quality of carpet. We think it is a great idea to take some measurements of your own before heading out shopping. It will help give you a general idea of the overall cost of the project so that you know which products you can be looking at realistically to stay within your budget. However, our strong advice is to take your measurements, and then hand them over to the salesperson. Calculating carpet requirements is much more complicated than simply adding up the square footage of your rooms. There are so many other things to take into consideration – such as the width of the roll of carpet, and the direction of the carpet pile, for starters – that simply multiplying your measurements will usually not give you an accurate outcome. The salesperson will know how to account for these considerations and should be able to give you an approximation of your total square footage requirements. Keep in mind, though, that the salesperson’s quote is only as good as your information: if you have measured incorrectly or left out important details such as closets or railing posts (which increase the labor cost) the true cost of the project will not be able to be determined until you have had a professional visit your home. Getting Taken In by a "Promotion"
We all love getting a deal, so it’s tempting to believe the promises of having a whole house of carpet installed for $99, or getting free underpad with carpet purchase. Sadly, though, many deals are literally too good to be true. Most often, the cost of these “free” or “discounted” products and services are just built in elsewhere. For example, consider a scenario wherein Company A is offering a $99 whole-home installation, and Company B charges $0.50 per square foot for the installation. If you have 500 square feet of carpet to be installed, Company B’s installation charge would be $250. On the surface, it would appear that going with Company A would save you $151. However, what you may not realize is that Company A will charge you for every piece of tack strip, every staple used, every inch of seaming tape, and so on. These are referred to as hidden charges and can drastically increase the overall price. These hidden charges are designed to recuperate the cost of the “free” installation. To avoid getting caught up in the wording of a promotion, be sure to get a complete, “all-in” price, and be sure you know what is included in that price, and what may be additional. If you have a basic, square room to carpet, that has nothing complicated involved, then you may be able to install the carpet yourself, or have your “handy” friend do it for you. Beyond that, however, you are likely better off having the carpet professionally installed. There is a reason that carpet installers are called professionals. It’s because they install carpet every day, and have all of the special tools and experience required to do it properly. Yes, carpet installation can be expensive, especially if you have a lot of upholstery work involved (stairs, railing posts, etc.). But a poorly installed carpet will not only look bad; it will also fail to perform the way the carpet should, and thus will require replacement sooner than it would have otherwise. Consider also that many warranties stipulate that the carpet must be professionally installed in order to be valid. So, spend the extra bit of money now to have it done properly, and save yourself a headache. 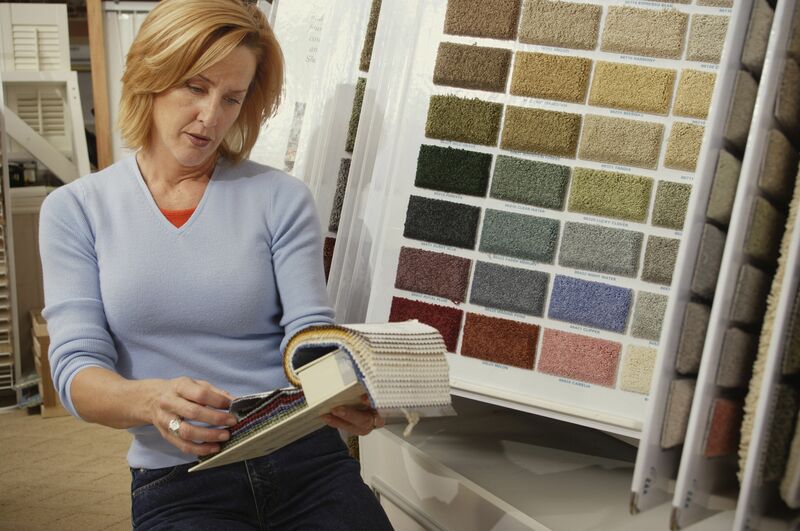 It is important to carefully consider your lifestyle when making a decision on carpeting. The type of lifestyle you lead and the conditions of your household should greatly influence your carpet choice. For example, a large family with multiple pets will have many different requirements than someone living alone. They will require a carpet that can withstand higher amounts of traffic and that has increased stain resistance. They may also choose to look for carpets that are close in color to their pets (less showing of pet hair on the carpet) or that tend to hide dirt easily (flecked Berbers or Friezes, for example). Those living in traditionally sunnier climates will be more concerned with fade resistance, while those in damper climates will want to look at synthetic carpet fibers that are less prone to mold and mildew. Unfortunately, the carpet we need may not always be the carpet we want. It can be easy to be swept up in the images shown in magazines, featuring glamorous rooms with pristine white carpets. But before you run out and buy that white carpet, consider if it will actually work with your lifestyle. What Is the Ideal Carpet Density?